What teams are in Gonzaga's path if the Zags want to make a Final Four run? The Zags could see some familiar foes in this year's tournament. The last time we saw the Zags on a basketball court, it was ... not good. After dominating the West Coast Conference through an undefeated regular season and pummeling Pepperdine in the conference tourney semifinals, Gonzaga saw their rival Saint Mary's beat them in every facet of the game, and the final 60-47 score actually made the game look closer than it was. The Gaels dominated Spokane's hometown heroes so thoroughly that many national prognosticators thought the Zags might lose their No. 1 seed for the NCAA tournament. On Sunday as the tournament field was revealed, we found out that didn't happen. The Zags' 30-3 record still landed them the top spot in the West, and a potential path to the Final Four in Minneapolis that's riddled with worthy opponents and familiar faces. Let's break it down. Step One: Gonzaga is immediately at a disadvantage of sorts in that they didn't find out until Tuesday night who they'd open against in Salt Lake City Thursday. Fairleigh Dickinson, a team that shoots three-pointers at a Top 10 clip nationally, faced off against Prairie View A&M after the Inlander's deadline. Suffice to say, it would take a near-historic upset for either to beat the No. 1-seeded Zags. Step Two: The Zags will face either Syracuse or Baylor to move on to the Sweet Sixteen in Anaheim. Baylor has lost four straight heading into the NCAA tourney, but has some big wins this season, including two against Big 12 champ Iowa State and another against a No. 3-seeded Texas Tech. Syracuse needs no introduction to Gonzaga fans. Coach Jim Boeheim and his annoyingly effective zone defense have knocked the Zags out of March Madness a couple times, including in 2016. The Zags should beat either of these teams, but March is "mad" for a reason. Step Three: If the Zags reach the Sweet Sixteen in Anaheim, they're assured of some difficult foes to take on before reaching the Elite Eight. 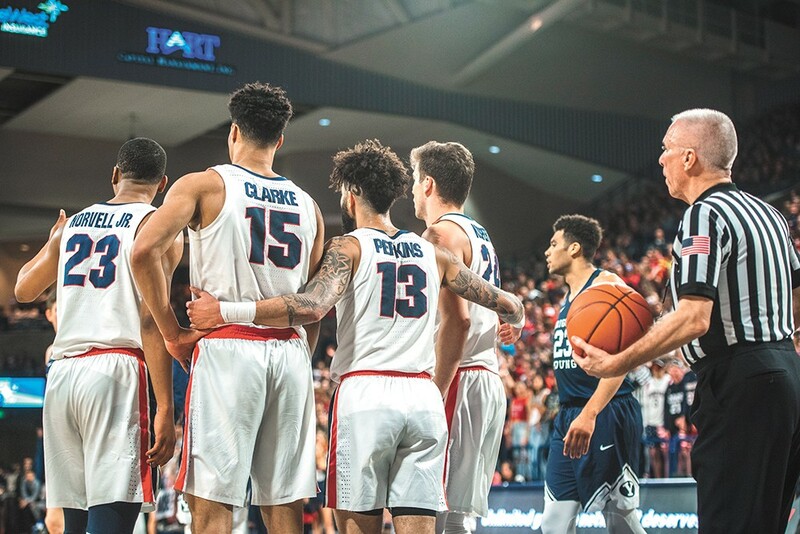 Florida State, who knocked Gonzaga out of the tournament last year, lurks with a team of lanky, tall athletes fully capable of making life miserable inside for Zags stars Rui Hachimura and Brandon Clarke. Marquette could be waiting with four players all capable of lighting it up from outside, and potential Cinderella story Murray State boasts Ja Morant, averaging 25 points and 10 assists and an expected Top 5 NBA draft pick this summer. Step Four: If the Zags win their first three games and reach the West Regional Championship, they'll likely tip off against one of the best teams they've seen all season. That could be 2-seed Michigan out of the Big 10, arguably the best conference in the country this year. It might be Nevada, who was ranked in the Top 10 nationally for much of the year until a late-season swoon. Perhaps it will be 3-seed Texas Tech, who shared the Big 12 title, or a Buffalo Bulls team that went 31-3 before the NCAA tournament started, winning the MAC title. Gonzaga vs. the winner of Fairleigh Dickinson and Prairie View A&M tips off at 4:27 pm Thursday on TruTV. The original print version of this article was headlined "The Road To Minnesota"